Yesterday, Facebook announced their financial results for Q3 that showed mobile advertising revenue rising to almost $2 billion, almost 60% of their total revenue. 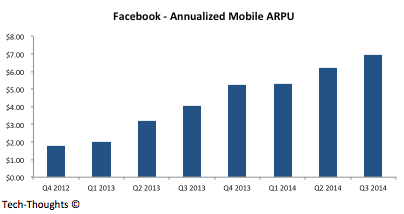 This growth wasn't just driven by mobile MAUs, but also by mobile ARPU (shown in the chart above). In a way, this growth explains why Facebook isn't as concerned with Whatsapp's monetization, at least for now. Facebook also revealed some metrics for Whatsapp, which should help us understand their strategy. One way to benchmark Whatsapp's performance may be to compare it to the gold standard in mobile monetization -- LINE. 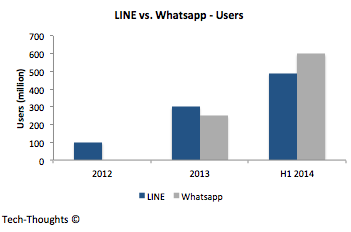 This chart should give us a decent understanding of Whatsapp's scale. Since the chart compares Whatsapp's active users with LINE's registered users, it actually understates Whatsapp's user base (on a comparative basis). This also explains why Mark Zuckerberg and Jan Koum are so focused on user growth. The reach of mobile apps is unlike anything we've seen so far and the messaging wars are far from over. The market is still fragmented by region and penetration in those regions remains low. In short, there is still tremendous room for growth. Now this is the interesting part. In H1 2014, LINE generated more than 20 times of Whatsapp's revenue. Also, LINE seems to be on pace to double it's revenue from 2013. One way to look at this chart is to say that LINE has succeeded where Whatsapp seems to have failed. 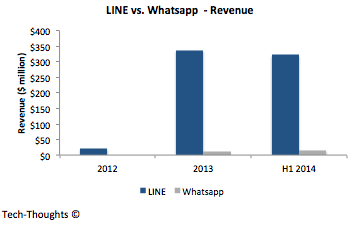 But in context of the user base comparison, it seems as though LINE's revenue growth shows Whatsapp's untapped potential. While LINE has been very aggressive in exploring multiple monetization models, from gaming to direct brand-to-consumer messaging, Whatsapp has remained conservative. So when Facebook eventually does decide to leverage their access to brands and developers, Whatsapp's financial metrics could look markedly different.